History: (Marvel Knights Spider-Man#10) - After Spider-Man and the Black Cat broke Norman Osborn out of Ryker's Island, Hydro-Man and Sandman ambushed them both on the beach. They were soon confronted by Osborn, who had donned his goblin-gear, as well as the Lizard, the Vulture, the Shocker, Electro, the Chameleon, Hammerhead, Tombstone, and Boomerang. The Goblin introduced them as the Sinister Twelve, but regretted that there were only eleven of them, owing to the absence of the Scorpion. Gargan then announced himself, having discarded his new Osborn-designed Scorpion suit in favor of Eddie Brock's discarded Venom symbiote. (Marvel Knights Spider-Man #11) - While the Goblin and Venom bickered over the disruption Gargan's new powers would cause Osborn's intricate plan, Spider-Man took advantage of the distraction to attack the remaining ten villains. The Black Cat followed suit, but was soon dispatched by Electro (much to the dismay of the Vulture, who'd wanted vengeance on her for an earlier betrayal). As the Green Goblin sped off to murder Mary Jane Watson, Spider-Man was overwhelmed by the villains, who had since been joined by Venom. As they began to overwhelm him, the battle was joined: the Avengers, the Fantastic Four, and Daredevil arrived, having been contacted by Mary Jane. They quickly mopped up most of the Twelve, leaving only Venom to pursue Spider-Man as he swung across the city towards Mary Jane and the Goblin. After a brief aerial battle, Spider-Man managed to stop Venom from pulling a building down on the crowded streets below, and subsequently pulled a building down on Venom himself. Leaving Venom for the police, he continued on to the George Washington Bridge, where he found an unconscious Mary Jane and the Green Goblin. (Marvel Knights Spider-Man#12) - Before Spider-Man and the Goblin could start fighting, Doctor Octopus arrived, having been brainwashed by an immense government conspiracy to kill Osborn. While the drugged and sluggish Octavius was easy prey for the Goblin, he provided a distraction, allowing Spider-Man to wear him down (and allowing Mary Jane to shoot him). The weakened Osborn was attacked again by a renewed Doc Ock; after a brief struggle, both combatants were stuck by lightning and plummeted into the river below. While Doctor Octopus was eventually recovered alive, Osborn made a clean getaway. Comments: Created by Mark Millar, Terry Dodson, & Rachel Dodson. 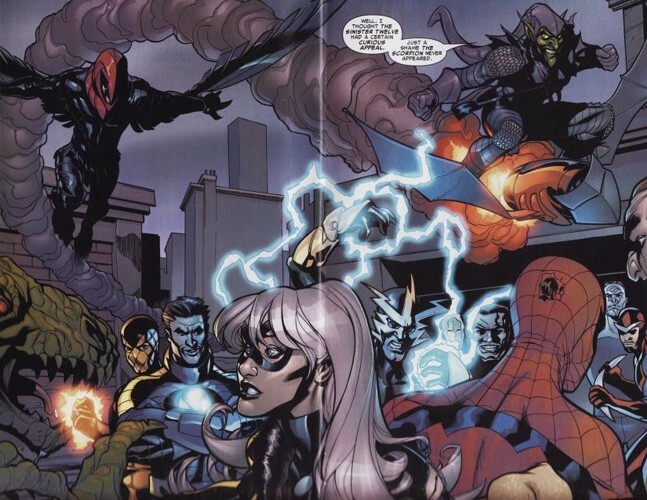 The Twelve manages to incorporate half of the original Sinister Six (Electro, Sandman, and Vulture; the original Mysterio and Kraven were dead, and Doctor Octopus was in jail), as well as half of the Sinister Syndicate (Boomerang, Hydro-Man, and Shocker; Rhino was in jail, Beetle had reformed, and Speed Demon was washing his hair that night or something). Pretty poor showing for Spider-Man's twelve deadliest foes, huh? Well, "deadliest" is a bit of a stretch. Seriously, Hammerhead? Chameleon? That said, these guys could have been a decent threat if they'd been around for any reason other than briefly distracting Spider-Man. Maybe we could get a reunion.